Eighteen woodcuts (monoprints) 130x90 cm, 2013. Some see here just an unfinished work of ancient stone masons. But many local legends tell something else - Aramu Muru is seen as a portal to a spirit world. It is not known when Aramu Muru was made and who did it - but most likely it happened before Incas. No archaeological research has been done here. 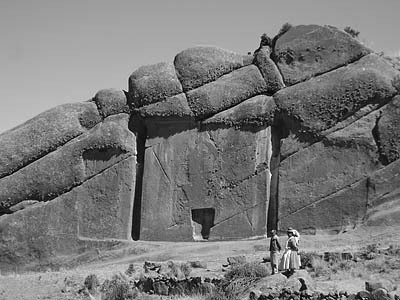 This enormous stone portal is located in Hayu Marca ("City of the gods") near the shores of Lake Titicaca. Giant crests of red granite rise from the dry soil of Altiplano here. Erosion processes have formed natural bridges, weird grottoes and natural sculptures. Often it is hard to tell whether some weird shapes have been formed by nature or by humans. Aramu Muru is cut in the side of one such granite crest. This portal is 7 m high and 7 m wide, with a "T" shaped alcove in the bottom middle. The surface of the portal is polished. Alcove is some 2 m high - one man can fit into it. In the centre of alcove is a smaller depression. On the other side of the cliff in earlier times was located a tunnel, which is blocked now with stones to prevent mishaps with children. Some believe that this tunnel was going to Tihuanaco. Local tourist guide Jose Luis Delgado Mamani had unusual dreams in 1990ies. He saw weird, red mountain with a gate cut in it. The door of this portal was open and a blue, shimmering light was shining out of it. Mamani was surprised to find mountains similar to the ones in his dream. He asked the local old men whether there are some gates cut in these cliffs - and, yes, they confirmed - there is a gate. Some tried to dissuade Mamani from going there - "this is the true gate to the hell". When Mamani reached the gate, he almost passed out from excitement - this was the site which he saw in his dreams. This story made into local newspapers and somewhat later - into international press. The old, exotic story about Aramu Muru became popular again. According to a local legend, this gate leads to the spirit world or even - to the world of gods. The portal was made in the distant past. In those times the great heroes could pass the portal and join the pantheon of gods. Sometimes though these gods return to the land through these gates "to inspect all the lands in the kingdom". Legends tell that the gate was open for a while in the 16th century. Back then Spanish Conquistadors were looting the immense treasures in Cusco city and slaughtering local people. In the most important Inca temple - in Coricancha temple - were located especially valuable relics - the golden discs. According to the legend, these discs were given by gods to Inca. Discs had powerful healing abilities. Two of these discs were seized by Spaniards, but the third one - the largest - disappeared without a trace. A priest of Coricancha temple - Aramu Muru - managed to escape from the deadly havoc in Cusco. He took the large golden disc with him. Aramu Muru reached the Hayu Marca hills and hid there for a while. He stumbled on Inca priests - guardians of the portal and, when the guardians saw the golden disc, there was arranged a special ritual at the gate. This secret ritual opened the giant portal and blue light was shining from it. Aramu Muru entered the portal and has never been seen again. The gate got his name. Later this place was found by Spaniards. They desecrated it, removed any visible artefacts and declared that this is an n place - a gateway to the hell. Legend goes on and tells about the future: one day this portal will open. It will be much larger than it seems now. Gods will return through it to the Earth in their Sun ships. This legendary site has served as an inspiration for many contemporary stories and pseudoscientific works. Thus, for example, - some locals tell that the coming of gods can be observed now. From time to time the mysterious blue light shines from the alcove and shining beings come out from it. Another story tells, that at certain times of the year this cliff becomes transparent. Researchers of paranormal activities are reporting glowing blue spheres and bright white disc shaped objects here. Aramu Muru is visited by tourists, which are interested in such mysterious places. Seekers of mystical experiences are stepping in the alcove and setting their heads against the cliff. Some reportedly see stars, some - columns of fire, some hear rhythmic music. It is very well possible that Aramu Muru is an unfinished rock cut temple. As the time went by, people were fascinated by this door, which leads to nowhere and they created legends about the "gate to the world of spirits". The "enlightened" 20th and 21st centuries have not been any better. We have experienced thousands of new legends popping up from nowhere in numerous sites around the globe. When googling for "Aramu Muru", one sees a wild flight of imagination, involving the mystical Lemuria and Mu and UFO's. Thus Aramu Muru represents an interesting monument to the past and - an interesting insight into the soul of modern man, desperately searching for a replacement to the lost religions.